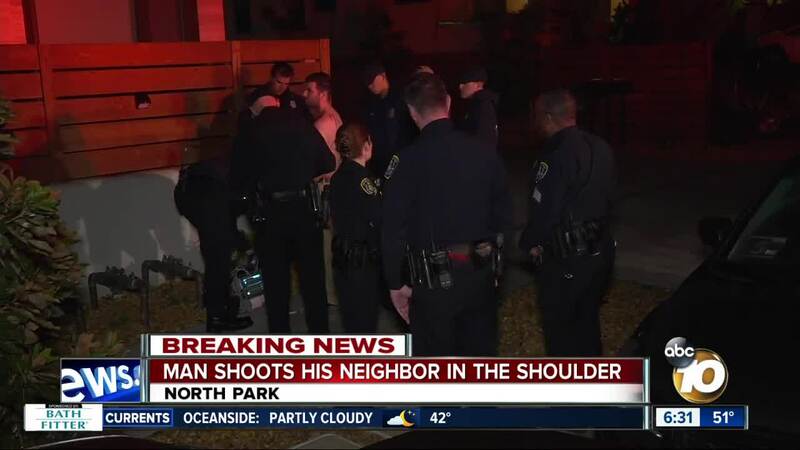 SAN DIEGO (KGTV) - Police detained a North Park man on suspicion of shooting his neighbor in the shoulder early Friday morning. The shooting was reported shortly after 4:30 a.m. in the 3700 block of Louisiana Street, San Diego police said. While the circumstances that led to the shooting remain under investigation, police said the suspected shooter was detained and no longer a threat to others. The victim suffered a non-life threatening gunshot wound to his shoulder and was taken to the hospital for treatment. 10News learned the suspected shooter actually called 911 hours earlier to report someone in his yard and he feared for his safety. Responding officers searched the area and did not find any possible threat. However, the same man reportedly called police again Friday morning and claimed he had armed himself. During the call, he said he shot his neighbor, who was smoking a cigarette outside. A rifle was recovered at the scene, and police determined that the weapon was a pellet gun.